This morning the Census Bureau released the 2016 American Community Survey data. There is a ton to unpack here and even more once the microdata is released later this year. In the coming months our office will update and share some of this work. In order to not bury the lede regarding the 2016 ACS data, Oregon’s household income and poverty numbers look very good. I don’t want to oversell the data, but they are among the best readings in Oregon’s modern history. The underlying, or internal dynamics behind the topline data are even better. This does not mean the economy is perfect, or without issues. We know there remain substantial problems and challenges. It does mean, however, that considerable progress has been made during the current economic expansion following the financial crisis. These gains are not evenly distributed across the state as each regional economy is at a somewhat different point in their local cycle, but taken as a whole, Oregon is finally doing OK again. Oregon is once again close to where it was during the late 1970s, late 1990s, and arguably better than the peak of the housing boom. Importantly, should the expansion last another couple of years, which many economists expect, we are very likely to finally break through many of the stagnant trends of the past 15-20 years. Whether that will be temporary or permanent is not yet known. However the economic trajectory in recent years has been quite good, particularly here in Oregon. 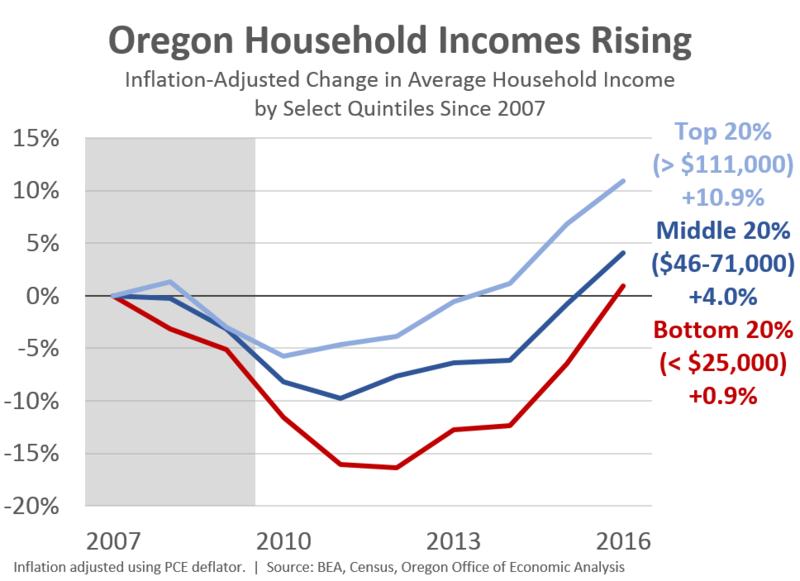 In 2016, Oregon’s median household income, after adjusting for inflation, is at or near the highest it has ever been. I only qualify that due to the margin of error surrounding these estimates and depending upon which inflation measure one uses. 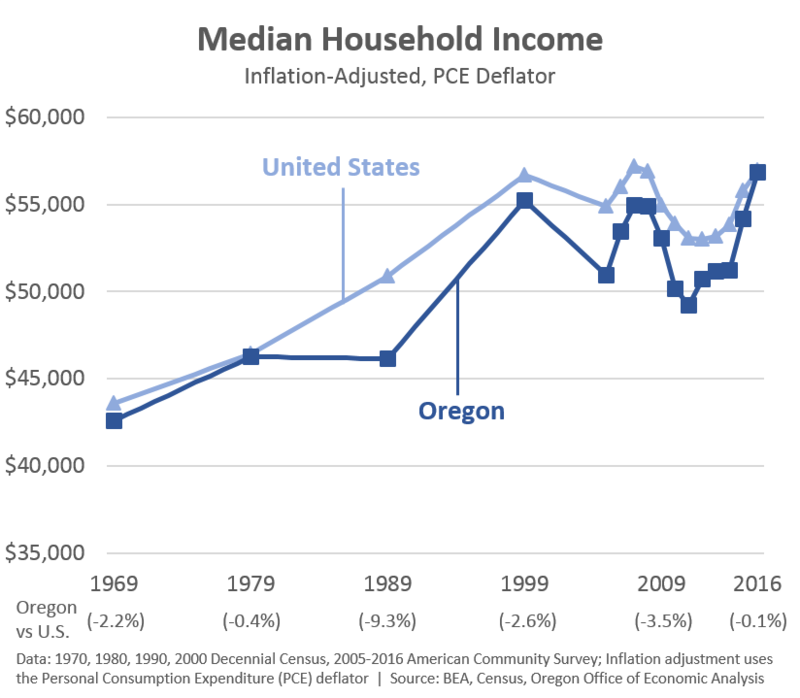 Clearly, however, income for the typical Oregon household is back to where it was, if not a little better than at the peak of the dotcom and housing bubbles. Furthermore, the gap between Oregon’s household income and the U.S. is effectively gone. Oregon has typically been 2 or 3 percentage points lower that the U.S. but in 2016 Oregon is just a hair below. And that gap is not statistically significant, for what it’s worth. See here for more on the different measures of income and how Oregon and the U.S. compare. 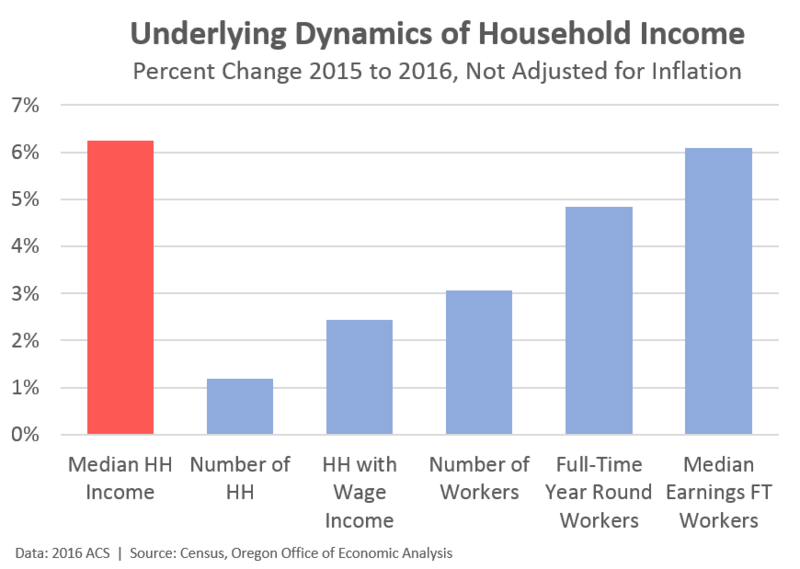 In looking at the drivers of median household income in Oregon last year, the underlying dynamics look even better. These gains are all about a strong economy approaching full employment. The number of Oregonians with a job is up about 3%. However the number of Oregonians working full-time is up nearly 5%, and for these full-time, year round workers their earnings are up over 6%, nominal. Those are increases in median earnings! Inflation-adjusted that is a 4.8% gain; a tremendous improvement. Possibly the most encouraging part of these improvements are the gains seen for households in the middle and bottom part of the income distribution. In 2016, incomes for these households are once again above pre-Great Recession levels after adjusting for inflation. Remember, these households are fully reliant upon a strong economy to generate any sort of income gains. High-income households generally have a high-wage job and other sources of income like capital gains, rental income, and the like. Low-income households only have wages, and in some cases the safety net. 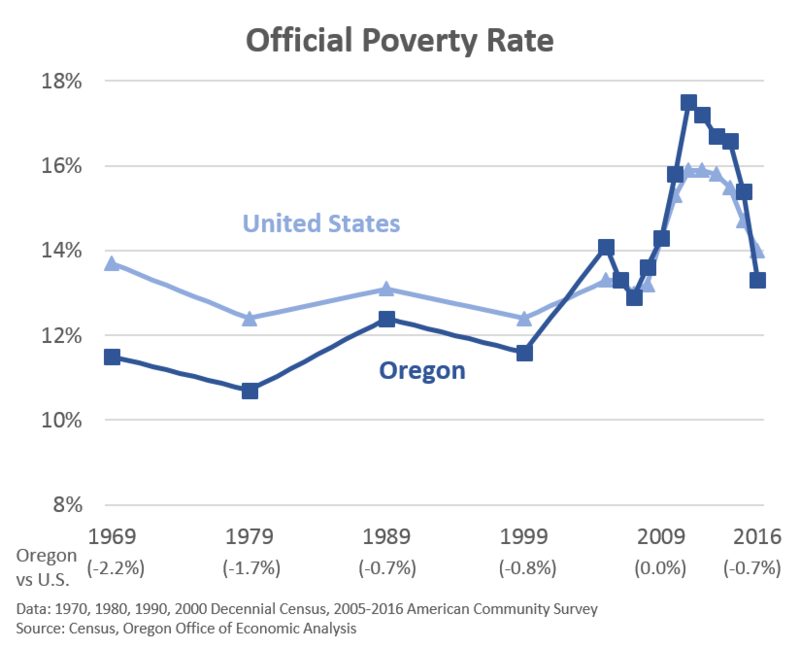 Finally, the strong economic improvements that are translating into income growth for all households are now also pulling more Oregonians out of poverty. Oregon’s poverty rate in 2016 stands at 13.3% and below the national average. That said, the poverty rate is still a bit above where it was in 2007, and remains a couple percentage points higher than in 1979 and 1999. Poverty rates, needs-based caseloads, and demand for other social services are among the last things to turnaround. Oregon is once again squarely in the feel-good part of the business cycle. Further progress remains, however the economy is getting there. Posted in Demographics, Employment, Income, News, State Comparisons | Tags: 2016, household income, median household income, Oregon, poverty, poverty rates, U.S.
Hey Josh, can I get microdata from different states in America to use it for my teaching and comparative research with Pakistan for my courses? It would help me develop a module of Comparative Development Economics for Pakistan and USA and hence policy makers might get it useful. Hi Muhuammad. Yes microdata is available via Census site or Univ of Minnesota site (IPUMS). Census you can download all the data, or hook up to an API (I haven’t done that). IPUMS is great as they let you download just the variables you want for the years/samples you want. That’s what I use. You need to register on their site and then extract the data you want. IPUMS-USA is what the Census/ACS data is called. Thank you so much Josh. I am active user of IPUMS since 2010 but I thought this survey data is not part. The topic of Poverty and Progress caught my eyes :). Many thanks and I am sure, we will learn more together in the future.